I loved playing outdoors as a kid. By the time I got to college I was looking for opportunities to do schoolwork outdoors. There were a lot of classes and research opportunities [for which] I could work outside and travel for by doing soils projects. I really loved that. I did a number of field classes, and there were two big field projects that I worked on. One was researching arsenic contamination of groundwater in Cambodia, which actually had a geologic source. Another project that I worked on was looking at soil phosphorus levels in agricultural soils in Hawaii. I went to Hawaii three times and Cambodia three times in college for field expeditions. You’re quite entrepreneurial, though most of your training is in science rather than in business. How did you connect these interests? My father was in business, and my two grandfathers also had owned businesses. So I grew up talking about business around the dinner table a lot with my family. That definitely shaped my worldview, and it’s how I approach problems. As a kid I was not at all interested in going into business. I actually thought it looked really boring. But as an adult I found it’s actually really interesting to see how we can solve problems through business, through capitalism, and using that as a lens through which to look at environmental issues, and in turn provide solutions for long-term environmental issues. I definitely did a big 180 on that and came to really appreciate what I’ve learned from my dad and grandfathers. Can you talk about your sister company, the Roof Crop? I’m a cofounder, and at the Roof Crop we will farm any Omni Ecosystems green roof, and we will lease it from a building owner. In the city of Chicago, green roofs are more or less required under the city’s sustainable development policy for new construction. What that means is that developers and building owners can meet this city of Chicago requirement, while also then leasing the roof space and paying off the cost of that green roof in less than 10 years. We’re really excited about seeing what this can do for the financial aspects of green roofs. Also creating jobs, and creating more sources for local food in the city. We have a crew on staff—of mostly college students—that farms these roofs. Well, we just completed a green roof on the West Loop that’s a rooftop farm. It’s about 10,000 square feet, and it’s right now got a bunch of things sprouting up. Things are really starting to grow. We seeded in just a few weeks ago, and we put in a few plugs. I think we’re going to have some crops to harvest in the next two to three weeks here. We’re really excited about that. We’re going to be able to really see where our model’s been suggested in terms of payback period on the roof because we’re going to finally be at a large scale. One project that I’m really excited about is a meadow that we’re still working on, on the Keep Indianapolis Beautiful roof. That one is three inches deep, about 15 pounds per square foot, and 85 percent native. Which is remarkable. It’s grasses and perennials, right? Predominantly, yeah. On that roof we also have an energy study taking place. We have been monitoring the temperature of the roof membrane and various parts of the green roof profile over the past year, and we’re continuing to do so. We’re also looking at the energy usage data from before the green roof went on, and now after the green roof has been on, and comparing that to see how much energy can be saved due to a green roof when that’s the only change they’re building it for. Are there any other studies that have been done that compare the performance of a bare membrane and vegetative roof on a single building? Not to my knowledge—[not one] that doesn’t have any other change like that. I’m familiar with Chicago City Hall [Editor’s note: The interviewer’s employer, Roofmeadow, provided technical design services, construction review, and a long-term warranty for that project. ], for example. My understanding of that project is they also added insulation to the roofs, so that isn’t exactly comparable. That green roof had an energy study on it. I don’t know of any other study to the scale that the Keep Indianapolis Beautiful one’s done on. How is your work affected by climate change? It’s a really good question. We are providing these various ecosystems in urban areas, and they’re fixed in location so that they can’t move with extreme climate events like other ecosystems—through the eons glaciers have moved, and extreme events have occurred. We have to create a fixed ecosystem, which has very, very limited resources. There’s a shallow rooting depth, a limited amount of water. Those things really impact what we’re trying to do, but we still have extremes of temperature and moisture that have to be managed in these fixed conditions. I think that’s one thing that’s tricky about climate change. We’re seeing more and more extreme events, but we still have the same fixed conditions that we get to work with in the built environment. Would you say that green roofs are less adaptable ecosystems than an ordinary ecosystem on the ground? Well, I hesitate to say that because so many of our ecosystems on the ground now are man-made. 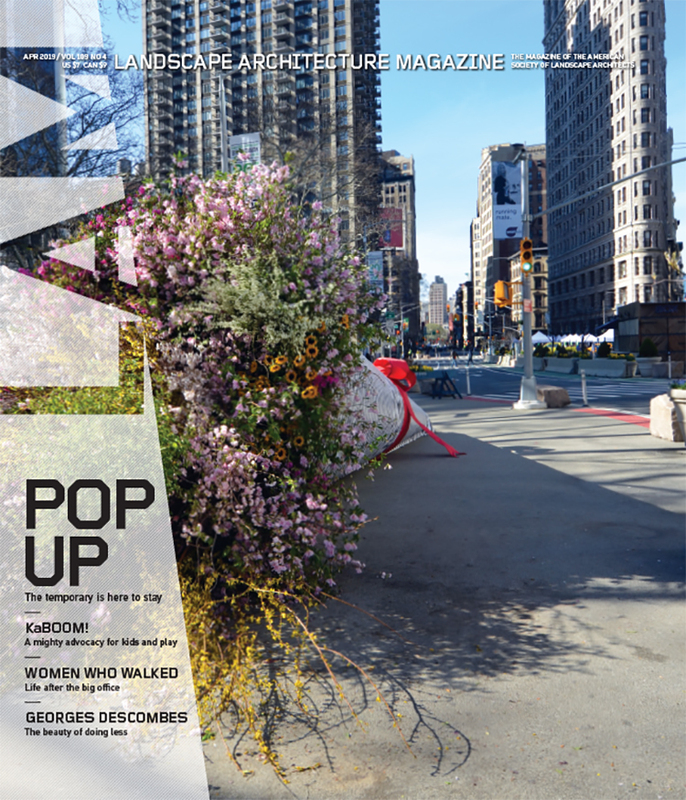 Inherently, a green roof is an isolated ecosystem. It’s an ecosystem that we’re trying to create on a place where nothing is suitable for life. What’s native to a TPO [thermoplastic polyolefin] roof membrane? There isn’t anything, and so I think that makes it tricky. On the other hand, I think climate change is affecting our work because people are starting to talk about it more. Recently, President Obama gave a commencement address and talked about how critical climate [change] is going to be to us and the next generation, and how immediate action is fundamental. It has to happen. I think that sort of conversation starts to happen more and more, and at a higher level, at a leadership level. Then it can actually open up opportunities for green roofs on more buildings, because it becomes part of the way people think about their impact on the earth, and how we’re all going to be adapting our environment to climate change. What is on the horizon that’s exciting? I’m really excited right now about a few different areas. I’m really excited about green roofs that can be farmed. I think rooftop agriculture is going to get more commonplace, and it’s going to be one of the factors that make green roofs financially viable. I’m also really excited about getting better understanding of how green roofs impact energy usage in buildings. I think the science on that is improving. I’m also really excited about seeing what happens with increasing biodiversity on green roofs. When green roofs are just focused on one genus of plant, like Sedum, it really creates a narrow sliver of habitat, with stopping places for migratory birds, and butterflies, and whatnot. But with meadow systems, they are packed with diversity. I think that we’ll see a lot more opportunities for connecting habitats and creating way stations for migratory species. 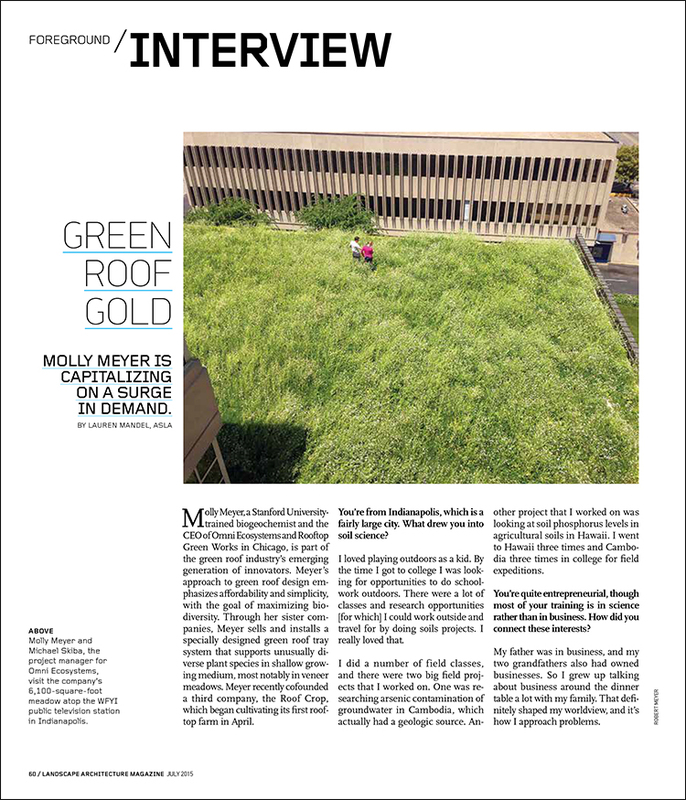 Lauren Mandel, ASLA, is a project manager and designer at the Philadelphia-based green roof firm Roofmeadow and the author of EAT UP: The Inside Scoop on Rooftop Agriculture (New Society Publishers, 2013). She blogs about rooftop agriculture at eatupag.com. Wow, that green roof is really amazing. I have seen grass roof’s on regular houses but that article is something else. Great work!